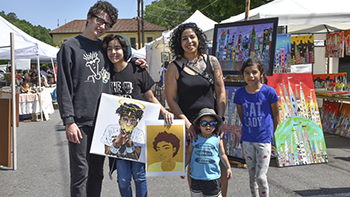 Art Springs is a free 2-day outdoor festival to be held Saturday, April 27 – Sunday, April 28, 2019 at Hill Wheatley Plaza in downtown Hot Springs. The festival is part of the Arts & The Park 10-celebration of the arts and features an Art Village of fine artist and artisan booths, a fine crafts Marketplace, a children’s art activity area, art demonstrations, free family-entertainment, and much more. Food trucks and beverages will be offering refreshments for sale throughout the event. Applications for artists and artisans are currently being accepted. Deadline: March 15, 2019. Artists and fine crafters/makers 18 years or older are welcome to apply. Historic Hot Springs with its Hot Springs National Park attracts visitors from Arkansas, Oklahoma, Missouri, Texas, Tennessee, and Louisiana, as well as visitors from other states and countries. In 2018, more than 7500 people attended Art Springs. Art Springs includes an Art Village for fine artist and fine artisan booths, a Marketplace for fine craft booths, a children’s art activity area, art demonstrations, and free family-friendly entertainment. Food trucks and beverages for sale will be on site. Festival hotel discounts will be available at selected downtown hotels. Early Bird Registration is only $20 for those entering prior to December 15, 2018, with the cost increasing to $30 after that date. Booth pricing begins at $100 for a single booth, however space is limited so early registration is encouraged. For more information, contact the event organizer at (501) 622-7030. Participation in the 2019 Art Springs is through a juried process consisting of a panel of 3-4 jurors. The panel will review all submitted applications and select artists. Consideration may be given to applicants with ties to the greater Hot Springs area, area of art, willingness to demonstrate and the date of application. Invitations to selected artists will be sent to each applicant via email no later than March 4, 2019. Artists must confirm participation by April 1, 2019. The call is open to all artists and fine crafters/makers 18 years or older. Applicants must submit 6 images representative of the work they wish to exhibit. All work must be original and created by the applicant. Artists: Reproductions (e.g. cards, prints) may comprise no more than 25% of inventory. Artists may only exhibit works in the medium they were juried into. Artists may sell only accurate representations of what their submitted photos depict. Crafters/Makers: Only hand made items are permitted. Craft items may contain purchased and/or reclaimed components. Hand made and home made items such as jellies and soaps are permitted. Crafters may only offer works representative of and described in their application. The Hot Springs Area Cultural Alliance (Promoter) shall have the right to use all submitted photos in promotion and advertisement of the show. Artist must be in attendance for duration of Art Springs. Artists are encouraged to demonstrate their art in their booth. We are using the Cafe website to handle the Application process and Judging. Click here to go to Cafe. Once accepted, booth fees will be paid here on HotSpringsArts.org. If you have been accepted, please pay your booth fees here. A single booth is 10′ x 10′. A double booth is 20′ wide x 10′ deep. Up to 60 booths may be assigned. Due to limited double booths and booths with electricity, apply as soon as possible. The Promoter will assign all booth spaces. Date of application, art category, willingness to demonstrate and ties to Hot Springs may be used as a consideration. Artists are responsible for their own tents, tables, chairs, displays, grounded extension cords and dollies/carts. Artists must provide their own booth sign clearly identifying the name of the artist and/or studio. The venue is black top/concrete. Tents may not be anchored to the ground. Tents must be weighted down. Hot Springs can be quite windy. Artists must provide their own weights for their tents. All tables must be draped to the ground. All boxes and packing materials must be hidden from view. There will be a stage with on-going live entertainment. No televisions, radios, cd players, etc. are permitted from 10 am – 6 pm. No generators are permitted. All prices must be clearly marked. No Sales or Discount signs permitted. Artists are responsible for paying sales taxes in accordance with Arkansas Department of Revenue collection agent’s guide sheets. Sales tax information packets will be given to exhibiting artists. Artists are responsible for the delivery, handling, erection and removal of their work and exhibit tent, tables, chairs, and equipment. Artists are responsible for keeping their area clean including during tear down at the end of the day. Trash barrels will be available. The event will proceed rain or shine. There will be no refunds or credits given. Artists check in at the Cultural Alliance Hub to receive their booth assignments. All vehicles must be moved off the show grounds by 5 pm on Friday and by 8:30 am Saturday. Artist parking areas are within walking distance of the show grounds. Open hours: Saturday, April 27: 10 am – 6 pm – Sunday , April 28, 2019: 11 am – 4 pm. Tear down Sunday, April 28: 4 – 6 pm. The Artists shall be financially responsible for any damage to caused by the Artists. HSACA shall notify the Artists in writing of the costs of such damage. The Artist acknowledges and agrees that HSACA is not responsible for damage due to outdoor conditions, inclement weather, and other factors outside of our control that may effect the event. The Artist indemnifies and holds harmless HSACA, its members, employees and trustees from and against loss, claims, damages, liability, and lawsuits arising out of the participation in and exhibition of his/her art work in this event. If HSACA or its members, employees or trustees are made parties in a lawsuit, arbitration proceedings or mediation involving the artist’s participation or exhibition of his/her art work in this event, the Artist shall be responsible for all costs incurred, including attorney fees, by HSACA, or its members, employees or trustees in such lawsuit, arbitration proceedings, or mediation. The artist is responsible for paying Arkansas state and city sales taxes.